These three maps showed up last week as well, and make a nice set with the North American ones a few days before. 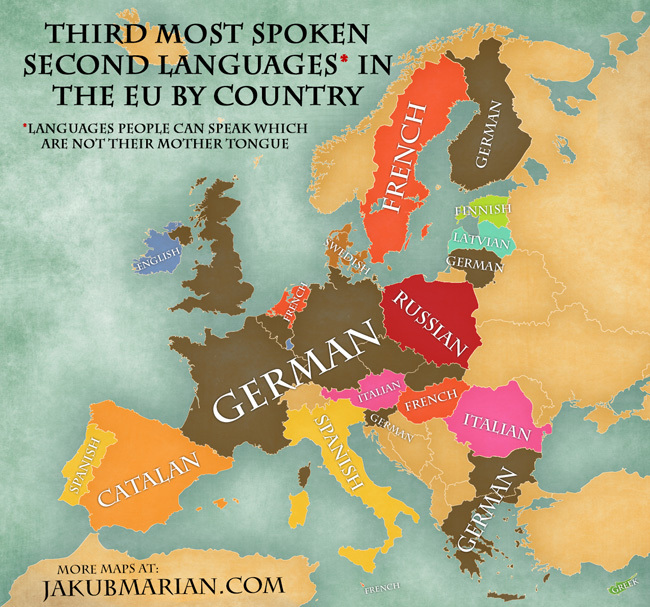 These show the most spoken foreign languages in Europe, followed by the second most, then third most. The first one is not that surprising. 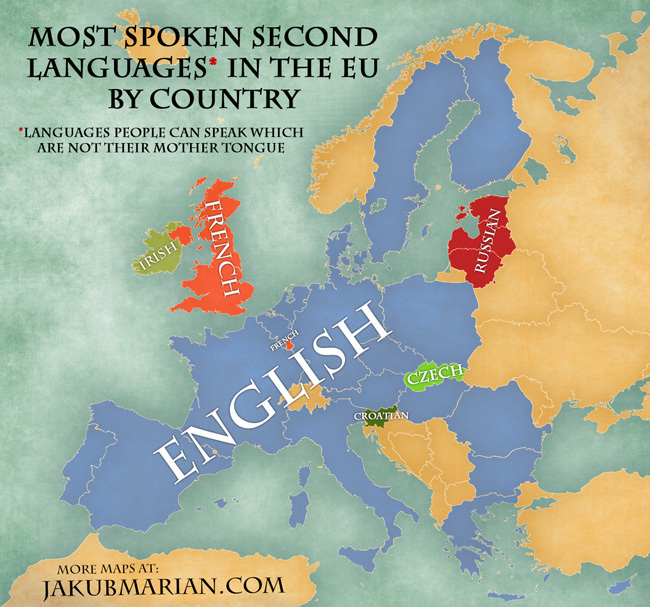 Most countries opt for English, English countries have something else (French and Irish for example), and the Baltic countries have a lot of Russian. 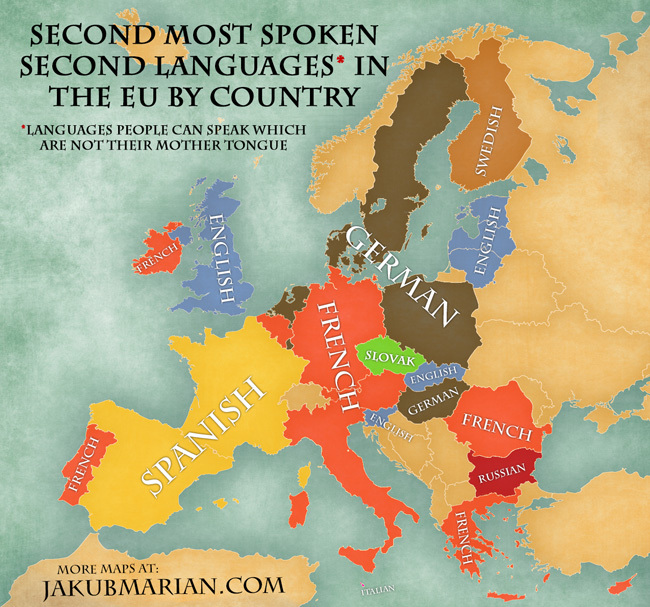 Czech and Croatian for Slovakia and Slovenia are also no surprise. Things start to get interesting in this second map. English is the second most spoken second language in the UK. You'll see this in countries with a large immigrant population. Czech Republic's Slovak is interesting because for them Slovak comes after English while in Slovakia Czech comes before it. German is still fairly strong in nearby countries, French is of course popular here and there, and lots of Bulgarians speak Russian. And now for the third map. Some of the countries that had French in the previous one now have German, Portugal interestingly is now finally getting around to Spanish (French came before it), Latvia's Latvian comes from the large Russian population there, Italian finally shows up somewhere (edit: wait, there it is in tiny Malta in the previous image). It looks like this is the point where people in countries with a very similar yet maybe not so useful sister tongue finally decide to learn it: see Finnish in Estonia, Spanish in Portugal, Swedish in Denmark, Spanish in Italy, Italian in Romania.